Although I have enjoyed noodle soup my entire life, I had not specifically appreciated the Vietnamese version (pronounced “fer”) until my friend Paul took me to a Vietnamese cafe in Sydney. Since that introduction it ranks in my top 5 of breakfast meals (somewhere between pork & egg congee, baked beans on toast and eggs benedict), though I usually find myself enjoying it at any time of the day. During my 18 day tour of ‘Nam, I enjoyed phở for breakfast every morning except one, when we were served breakfast at a homestay on the Mekong Delta. On that day I “compensated” by enjoying phở for lunch and dinner – even going so far as walking out of a restaurant in the evening when I discovered they didn’t serve it. Usually accompanied by at least one of my two reliable culinary partners, Jen and Joyce, I sampled the customary Vietnamese dish at classy restaurants, in nationwide chain eateries, at road stalls, and even at a place in Saigon that proudly boasted the fact it served a bowl to Bill Clinton back in 2000. In that case, it was the only feature that place could boast, and quite frankly how much of boast is “Bill Clinton was here” anyway? At some of the “fancier” places in Saigon I experimened with flank, tendon and tripe, and a place in Hanoi that exclusively served a chicken version, but on the whole I settled on a basic “phở bo”, a simple noodle soup with thinly sliced rare beef for most places, with the notable exception of a place in Hue that served the broth on the side, an unfortunate result of an ordering mix up that took place when Joyce tried to order noodle soup “without meat” (ie: vegetarian) but seeing the confusion being caused tried to revert back to “what the rest were having” – somehow this led to ALL of us having noodle soup without soup. 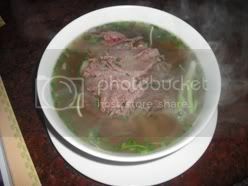 It is a dish called phở xiao, and I liked to call it “evil phở”. The secret to a good bowl of phở comes down unsurprisingly, to the broth. When it is served, it can seem like a simple dish. 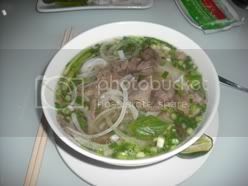 They ladle some noodles into a bowl, drop some rare thin slices of beef in there, and then ladle in the broth. A variety of optional extras were sometimes served to accompany the dish, with bean sprouts a great addition, but as simple as it may sound as a dish, it is the masterful mix of herbs and spices that go into the broth that make or break the bowl of phở. Not counting the evil phở, the worst phở I had was in a small phở shop in Hoi An that offered a feebly bland broth and proceeded to grossly overcharge me for being a tourist. On the other end of the spectrum, my favourite phở came from Hanoi – the spiritual home of phở, in an innocuous little street vendor called “Quay Nong”. I ended up going 3 times. By the third visit, I had dragged along 6 other people to join me. Okay, so I didn’t cover that much of the entire country, but I covered all the major cities and after 19 bowls in 18 days, I felt pretty good about what I’d done. What can I say? 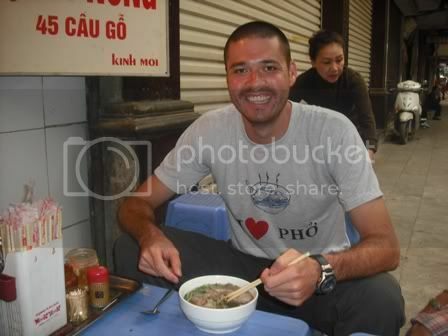 I love Phở. Great post Nick! Love the shirt too!